In Back to the Future 2, we were promised autolacing shoes by 2015. I figured I’d do my part and help make it happen. The power supply I designed can be found here, but if you don’t want to build that, you can buy something like this which should also work. Assembly is pretty straightforward. I’m not going to replicate the documentation of each of the components, but basically, you want to use an Xacto knife to carve out a notch in the shoe strap to install the motor, shaft coupler, and encoder. I used 40 lb test fishing line connected from the shoe strap to the motor shaft. This seems to be a good tradeoff between strength and thickness/rigidity of the fishing line. The elastic I used I got from Hobby Lobby, but other craft stores probably have it. 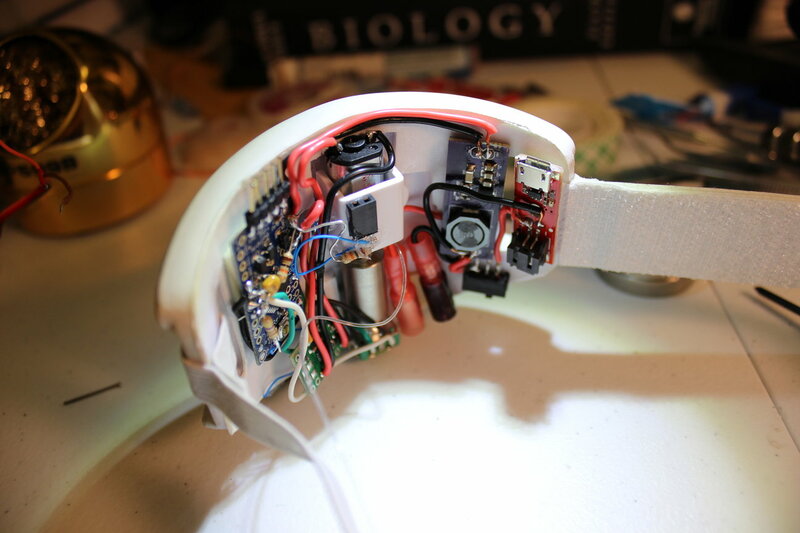 I used 3M double sided foam tape to hold all the components down and a little RTV over the wire connections from the button and pressure sensor socket since the 32 gauge wire I used there was getting torn off sometimes. I found that both superglue and 2 part epoxy actually didn’t stick very well to the inside surface of the straps. The rotary encoder is pretty bouncy, and the code does a pretty good job of debouncing, but if you want extra protection, you can add a small low pass filter by putting an RC filter on the input of the encoder to the Arduino. You can download the Arduino code here. If you want a pair of these yourself, the best option is to build your own. However, depending on interest, I might make a few pairs for people who want to just buy a preassembled pair. If you’re interested, fill out this form. I remember shortly after I saw the movie, I hot-glued a 1.5volt motor to the back of a high-top and wound the laces around the drive-shaft. Of course this was purely ornamental and the laces would just come unwound off the end of the drive-shaft while it was spinning, but my spirit was there! Glad to see the future is here! Cool build! The rotary encoder link takes me to the shaft coupler… can you update with the correct URL please? Thanks for catching that, it’s updated now! Can I please send you a strap to install this on? INPORTANT QUESTION: can I buy them from you? I am a producer at nat geo and I would love to talk to you about this awesome invention and maybe incorporating it and you in a story we are doing for Back to the Future Day. Shoot me an email asap and we’ll talk further. 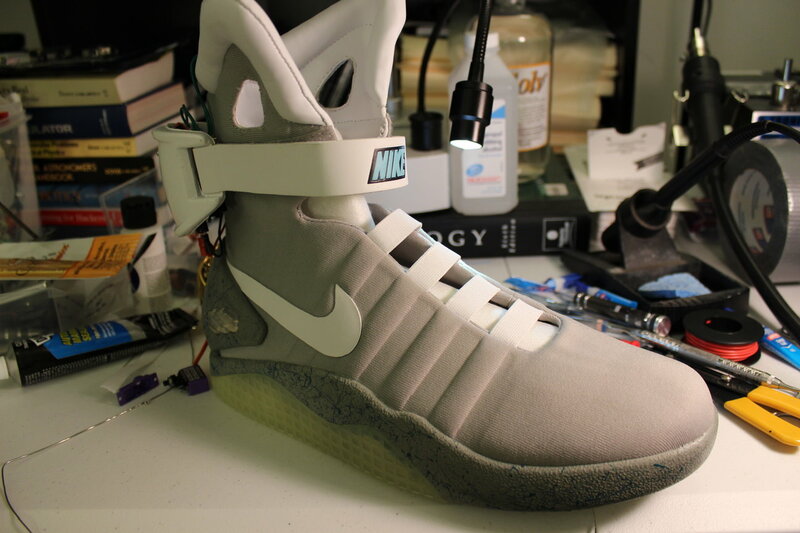 I’m doing a school project involving the Nike Mags; would you mind if I used some of your photos and descriptions in explaining how power laces could work? That’s amazing, I’m very excited of what you did with the Nike Air Mag on the video ! Hey, how much would you charge for a size 7 in women’s? Please get back to me. Thanks!!! What the impressing!!! You should apply to Nike bro!!! When and where can I buy these shoes? I am actually trying to build these to follow my aspirations to become an inventor but am confused on the hardware of the electronics… Could you please email me for assistance on some things? Anything would be appreciated.